Thanks to my hectic schedule these past few months, any type of baking has taken a back seat. But with cooler weather and the festive season both arriving, I could not resist the lure of my oven any longer. The thought of my kitchen filled with wonderful fragrances from baking kept swirling through my mind and finally I gave up and decided to bake something immediately. In a large bowl mix all the dry ingredients (items 1 through 9) well and add grated carrots, grated zucchini and grated apple and mix well. In a separate bowl whisk together flax seed meal + water until the mixture blends together a bit and becomes slightly gelatinous. Mix oil to this and pour the entire oil+ flax seed mixture on the dried flour+ fruits mixture and mix gently. Grease one large bread loaf tin or dish or two mini loaves tin or dishes and pour this mixture into it slowly. Bake at 375 deg F for about 30 to 45 minutes for a large loaf or 20 to 35 minutes for mini loaves or until a toothpick inserted into the center of the loaf comes out clean. Refrigerate the balance of the bread and use within a few days. The whole wheat flour mentioned above is not bleached whole wheat flour but unbleached flour made out of white whole wheat. This flour has a slightly lighter feel than regular whole wheat flour so the resulting bread is more airy and light. If you do not want to use either white whole wheat flour or barley flour you can use either all purpose flour (maida) entirely or half regular whole wheat flour and half all purpose flour adding up to 2 cups of flour. Instead of grating apple, you can also peel, core and cut the apple into small pieces. The bread looks very lovely and tempting.You r a talented abd a good baker. Looks awesome! I love the recipe! Wow wat a fantastic bread Usha, such a delicious combination..will try out soon..
All the good stuff are in this bread, looks delicious. That looks so healthy. This is one way I will eat zucchini for sure! We do have veggie fruits and evrything! I use a lot the unblea whole white flour recent... totally hooked on! Bread look very soft and colorful Usha..I too need to start baking, been off of it for quite sometime :) Thanks for the tips abt the flour...sounds interesting. 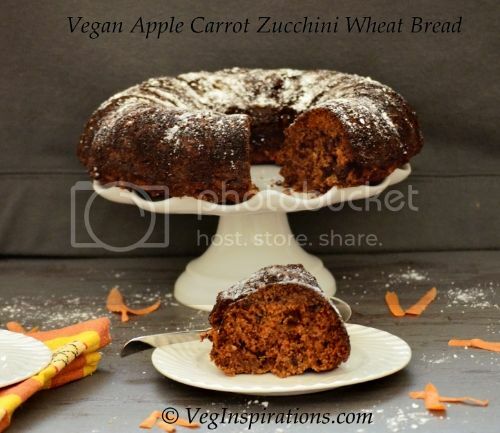 Great idea of baking vegetable breads. Looks perfect! Interesting as usual Usha. Btw what happened to the "notes" on barley flour.or did I miss something ? Veg bread looks soft and yummy! Bread looks so yummy and delicious. Great effort. This definitely qualifies as a very healthy and tasty breakfast and tea time snack. :)Trust me the photo is too good. The title is a mouthful, but the recipe and bread look amazing. Perfect for breakfast. Definitely a good way to make kids eat veggies. Wow a beautiful and a very moist looking delicous cake. The bread looks soft and yummy.. Definitely a helathy one too..
delicious looking bread usha !! fabulous bread. looks so inviting. and it's healthy too! Awesome !!! I used brown sugar instead of white and made them into muffins. Moist and delicious !!! !